STATUS: UNKNOWN: Green Knight was captured by Mr. Roboto, and a series of robotic "Green Knights" created by Mr. Roboto for his own purposes have been encountered. Rich businessman, socialite, and world traveler, Damien Styx is partial owner of Robotyx Inc., the world leader in Robotics, and various lesser companies. An inventive genius with multiple degrees from MIT, Damien is also secretly a mutant with an enhanced neurological system that grants him both advanced mental and physical abilities. Damien originally embarked on a career as a crime fighter under the guise of the Disruptor, but after being savagely beaten and left for dead by a supervillain (saved from death only by his advanced regenerative abilities), Damien used his scientific acumen to design a suit of armor for himself. To better protect his status as a mutant, Damien decided to design a suit that made it appear as if all of his powers were technologically oriented. "Lo and behold villain, your deliverance is at hand!" A low level mutant with advanced mental and physical abilities who augments his powers with a power armor suit, shield, and a technological mace with a nuero blaster built into it, and travels around on an advanced Jet Cycle with a on-board computer. He also has a lot of inventor/gadgeteer abilities to back up his power armor shtick. The player of the Green Knight turned out to not be a good fit for the group and was let go. 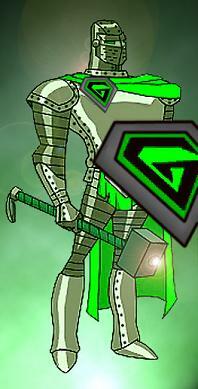 A shame, really, the Green Knight was a well-rounded and excellent addition to the group.